Since its inception over 80 years ago, the week-long seven- or eight-stage Tour de Pologne has grown and improved to become one of the highlights of the UCI World Tour. For some years, the race clashed with the Vuelta a España in September, but it has now found a home immediately after the Tour de France at the end of July and start of August. 71 cyclists participated in the first edition in 1928 organized by the Warsaw Cycling Society and the Przegląd Sportowy newspaper, and it remained open to amateurs only until 1992. It was in that year that Polish cycling legend Czesław Lang invested his own money in the race and it was soon attracting international stars such as Marco Pantani, Tom Steels, Jaan Kirsipuu, Alexander Vinokourov and Chris Boardman, as well as the best Polish riders. 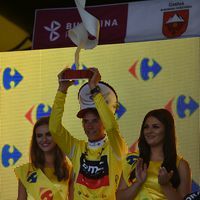 As the only event of its kind in Central and Eastern Europe, the Tour de Pologne was included in the ProTour cycle for the 2005 season and since then has been won by nine different cyclists including the 2013 winner, Orica-GreenEDGE rider Pieter Weening of the Netherlands. Poles Dariusz Baranowski and Andrzej Mierzejewski remain the most successful riders in the race’s history, with three wins and one third-place finish each. Importantly, the Tour de Pologne is much more than just a professional race. A mini Tour de Pologne, sponsored by Nutella, is staged for more than 10,000 school children and a mass bike ride is organised on the eve of the race.